This major, revisionist reference work explains for the first time how the Stationers Company acquired both a charter and a nationwide monopoly of printing. 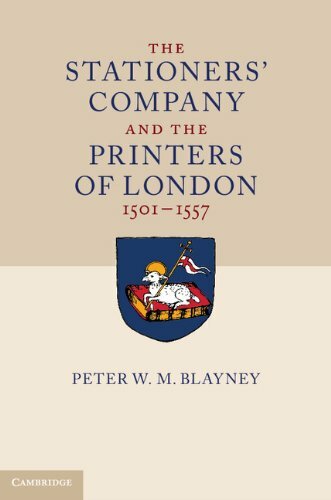 In the most detailed and comprehensive investigation of the London book trade in any period, Peter Blayney systematically documents the story from 1501, when printing first established permanent roots inside the City boundaries, until the Stationers' Company was incorporated by royal charter in 1557. Having exhaustively re-examined original sources and scoured numerous archives unexplored by others in the field, Blayney radically revises accepted beliefs about such matters as the scale of native production versus importation, privileges and patents, and the regulation of printing by the Church, Crown, and City. His persistent focus on individuals - most notably the families, rivals, and successors of Richard Pynson, John Rastell, and Robert Redman - keeps this study firmly grounded in the vivid lives and careers of early Tudor Londoners.